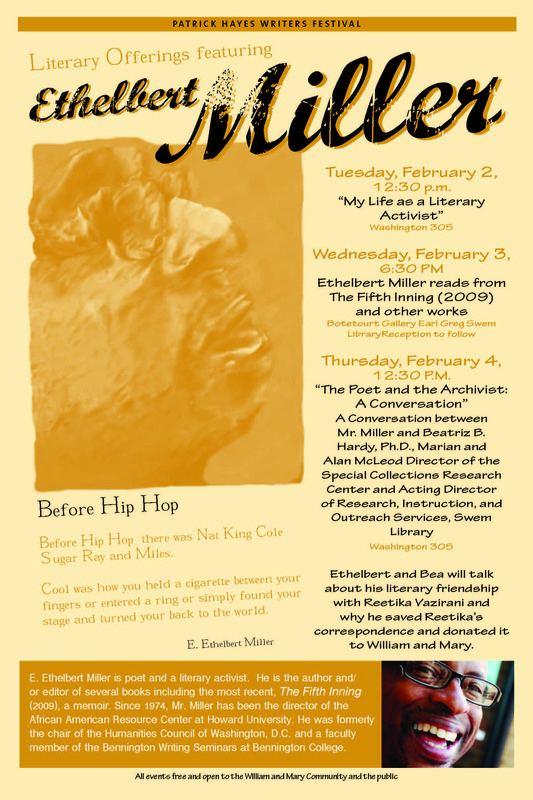 Acclaimed poet, professor, mentor and literary activist E. Ethelbert Miller will make three appearances at the College of William and Mary to lecture and read from Tuesday Feb. 2 through Thursday, Feb 4. All of his appearances are free and open to the public. Miller is here as part of the Patrick Hayes Writers Festival. "We are bringing the literary artist, our distinguished university archivist, the college community and the general public together in our library and the classroom," said Joanne Braxton, Cummings Professor of English, at whose invitation Miller is appearing. "We are, in fact, opening the university classroom to the public. This is one example of the many ways in which William & Mary demonstrates continued excellence in defining what it means to be a public university in the 21st Century." On Tuesday, Feb. 2, 12:30 p.m., Miller will discuss “My Life as a Literary Activist” in room 305 of Washington Hall. On Wednesday at 6:30 p.m., Miller will read from his 2009 memoir “The Fifth Inning” and other works at the Botetourt Gallery on the ground floor of Swem Library. At 12:30 p.m. on Thursday, Feb. 4, in room 305 of Washington Hall, Miller will be joined by Beatriz B. Hardy, Swem Library’s Marian and Alan McLeod Director of Special Collections Research Center, to discuss Miller’s role as someone who documents literary movements and what archives do with writers’ papers. At the same time, Miller and Dr. Hardy will discuss the College’s new exhibit of the works of the late poet Reetika Vazirani. Miller saved his correspondence with Vazirani, 2002 writer-in-residence at the College and winner of the 2003 Anisfield-Wolf Book Award, and donated them to Swem Library following her death in July, 2003. The exhibit, positioned at the front entrance to the library, will be available for viewing for three weeks. Miller played a role in helping to get Vazirani’s final poems, entitled “Radha Says,” published late last year. Drunken Boat Books published the collection, which was edited by Leslie McGrath and Ravi Shankar. 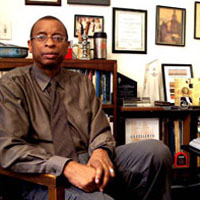 Miller has been the director of the African American Resource Center at Howard University since 1974. In addition, he was formerly the chair of the Humanities Council of Washington, D.C., and a faculty member of the Bennington Writing Seminars at Bennington College in Vermont. Mr. Miller was awarded the Mayor’s Art Award for literature in 1982. He received the Public Humanities Award from the D.C. Humanities Council in 1988. In 1993, the literary community of Washington awarded him the Columbia Merit Award. His book, “In Search of Color Everywhere,” was awarded the 1994 PEN Oakland Josephine Miles Award and was a Book of the Month Club selection. Mr. Miller received the 1995 O.B. Hardison Jr. Poetry Prize. In 1997, he was presented with the Stephen Henderson Poetry Award by the African American Literature and Culture Society. His book, “Fathering Words,” was selected by D.C. WE READ in 2003 for the one-book, one-city program sponsored by the D.C. Public Libraries.